HRW's 676 Page Report Lists Ban Only 4 Times, Soft on UN Inaction in Sudan, Haiti? UNITED NATIONS, January 23 -- Human Rights Watch's new World Report 2012 was launched in Cairo on Sunday by HRW director Ken Roth. 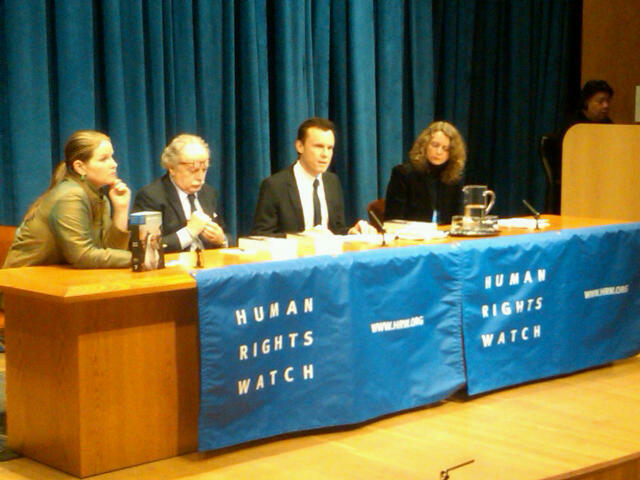 On Monday three HRW representatives held an "after-launch" at the UN in New York, ostensibly focusing on UN issues. Inner City Press asked HRW to assess the UN's actions in countries where it has peacekeepers: for example the allegations of and immunity for sexual abuse, in Haiti the alleged introduction of cholera, the failure to protect civilians in Southern Kordofan and now Jonglei State in South Sudan, the failure to follow through on Sri Lanka. HRW's Philippe Bolopion replied that while these are "valid questions," HRW bases itself on solid information and in these circumstances does not have access. While that might have been true in Jonglei at New Years, when the UN's alleged negligence meant it had no replacement military helicopters for the ones Russia had told the UN it wouldn't fly, it can't be true in Haiti. But while HRW's report mentions cholera, the UN's denial and then studies that "claim evidence that MINUSTAH soldiers most likely introduced the strain," HRW does not opine on the UN's failure to respond to formal legal complaints that it never established the standing claims commission called for its its Status of Forces Agreement. If HRW judges countries' systems of accountability and transparency, why be silent on the UN's? 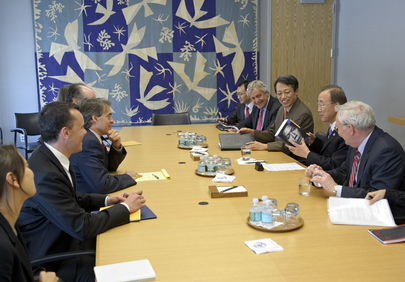 Back in May 2011, Inner City Press asked HRW for a simple read out of Ken Roth's meeting with UN Secretary General Ban Ki-moon, and received in return the following: "To preserve our ability to have frank discussions with UN officials and advance our advocacy goals, we don't typically communicate on the content of discussions we have with them." On Monday, Inner City Press asked how this is legitimate for an NGO involved in human rights, and what benefit HRW saw from this access in 2011. Bolopion insisted that "everything does not need to be public," that disclosure could even "undermine... our goals." But isn't the standard different for a meeting with the UN Secretary General, who also claims to be transparent? Bolopion said that no one questions that HRW is tough on Ban. Yes, a year ago HRW was critical of Ban. Then, as Inner City Press reported based on sources close to Ban, there was a backlash. There was a meeting, no summary of which was every given. And on Monday HRW largely complimented Ban, on Syria and Egypt. Ban Ki-moon is mentioned only four times in the 676 page report. Inner City Press an hour later asked Ban's spokesman Martin Nesirky about HRW's praise, as well as its light critique on, for example, Sri Lanka. Nesirky said the praise is "very welcome," then insisted that since Ban sent a report to Geneva, it is "up to member states." But this is not the stance he takes on Syria, for example, where he calls on the Security Council to take action. In September 2011 Ban committed to an inquiry into the UN's own actions in Sri Lanka. As Inner City Press has reported, Ban's own chief of staff Vijay Nambiar played a role in coaxing out LTTE leaders, who in turn were killed. Inner City Press asked on Monday about the status of the inquiry committed to four months ago, and even who is conducting it. We'll see. In terms of holding the UN accountable, the example Bolopion gave was Cote d'Ivoire, where he said HRW "raised to DPKO" (UN Peacekeeping) inaction by UN peacekeepers. Well, over the weekend in Yopougon in Abidjan, supporters of Laurent Gbagbo rallied and were attacked by Ouattara forces, with they say no response from the UN peacekeepers. Inner City Press has asked Nesirky for a response -- will HRW? Watch this site.